Honor yer Ma and Pa.
No telling tales or gossipin'. No foolin' around with another fellow's gal. Don't take what ain't yers. Patrina, I believe you are well. How is you Dad? It is well with you! Thank you for sharing something so simple that everyone can understand. I love it.How are you doing? There's a lot of truth in a wrangler's words - because they're based on the Word of the One who corralled my soul!! Clever, I really like these quotes. Blessings to you and yours. Wait a minute...is it the 10 commandment that was so simplified like that?...me likey! You've being in my mind for quite a while now...how is your health & that of dad? God is ever faithful....stay blessed. Hi Patrina, so glad to meet you. I like the simplicity of how the cowboys summed up the 10 commandments. Look forward to reading more from you. Have a great day. I LOVE IT!!! So glad you shared. Have a gorgeous day sis. It's always good to see you. As God may lead, keep me in your prayers today. I am one very tired momma. Blessings. Patrina, I just wanted to stop by and tell you how much your encouragment has meant to me. I have enjoyed your blog before - but this is the first time I read that you too care for your Father. Thanks you again! I have been here to read this post a few days ago... but wanted to come back at the right time to leave you my response. The simplicity of these words strikes me. These days the world is crying out for simple, down to earth, straight to the point honesty. 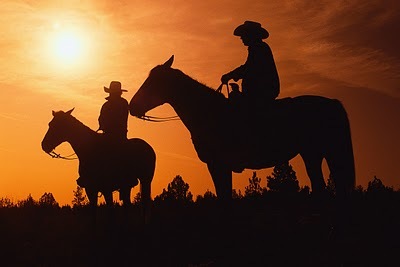 I also loved the photos of the cactus and the cowboys - all in silhouette. The contrast of the black and the orange - so simple and uncomplicated. Yet so strikingly beautiful. No additional words were needed. Thank you for your artistic eye, Patrina... and for always taking time to come up with a beautiful post...complete with relevant pictures and quotes. I just shared this with my Cowgirl Auntie and she loved it! Thank you for sharing this =O) Hope your week is full of blessings! A big AMEN from this Texas cowgirl! Pray things are going well for you & dad! This ought to be printed out as a cowboy poster. I bet it would sell. Love it. Such simple words with impact. Thank you! I know how much you love wearing your cowboy [girl] boots! Simply beautiful! Love the colors also of your blog. I found you on TRUTH SHARER'S blog. Your blog is quite appealing. It exudes warmth. The photography there is splendor! When I saw "Demon Buster" and "Warrior Bride" on your blog, my spirit was glad!